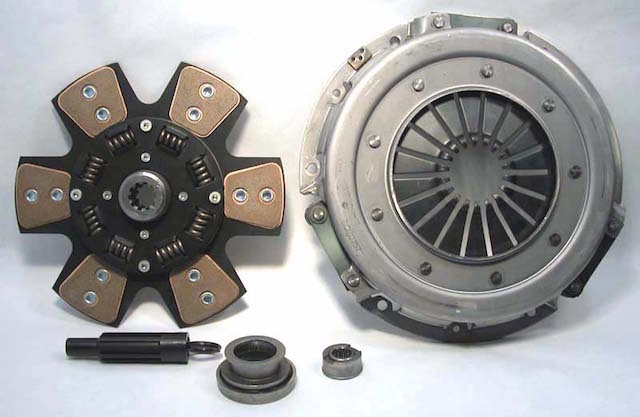 We now have the 10½" clutch kit used in Ford Mustangs with the 4.6L engine from 1996 to 2001, and the 5.0L engine from 1986 to 1994 up on our website. This is a very popular series for us and with all the Stage kits we have, you're sure to find one that matches your needs perfectly. Each part shows the recommended maximum engine torque capacity and resulting horsepower rating. We then list all the other versions so that you know what is available. The clutch kit shown in the photo is an 07-042.3C Stage 3 Ceramic button clutch kit that handles 390 lb.ft. of Engine Torque and 390 horsepower. It features a same as OE pedal pressure cover with a heavy duty dampened clutch disc with larger sized ceramic buttons for a much smoother engagement characteristic.